(APN) ATLANTA — In Atlanta Progressive News’s continuing coverage of the Georgia State House District 62 race, to replace State Rep. LaDawn Blackett Jones (D-Atlanta), this article contains the responses of candidate Rafer Johnson to the Atlanta Progressive News candidate questionnaire. Johnson is one of six Democratic candidates eying the seat. 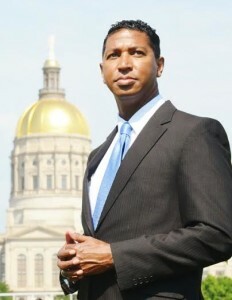 He is a flight attendant and former Fulton County Housing Authority chair from Atlanta. In addition, he has been a vocal advocate for incorporating a new City of South Fulton. The other five candidates are: Aaron V. Johnson, the senior assistant for policy and external affairs for Fulton County Commission Chairman John Eaves (District 1); Joshua B. Butler IV, an entrepreneur and community volunteer from Atlanta; Larry “LPJ” Perkins Jr., a businessman; Valerie V. Vie, an attorney from Douglasville; and William K. Boddie Jr., an attorney from Atlanta. APN is in the process of reaching out to each of the candidates with questionnaires. APN spoke with Aaron Johnson a few days ago, and Johnson said he would follow-up by phone. APN also spoke with Boddie and Vie; and has sent questionnaires to them. APN has reached out to Mr. Butler and to the Perkins campaign on Facebook. Yes, those are accountable items that should be public. With modern technology, we should be able to stream and archive the Legislative sessions and Committee Hearings. I support Nuclear Power as a relatively safe source of power. It also helps to reduce greenhouse gases that are currently impacting the earth’s atmospheric temperature leading to rising waters, disruptive weather patterns, etc. With the abundance of sun in Georgia, we should be offering incentives for every home and business to install solar panels and we should consider temporary tax credits for providers as we deal with a growing population, leading to a larger demand on our power sources. In addition, we face a new threat of cyber warfare leaving us vulnerable to power grid disruptions. Adding solar, wind and other green energy sources to our toolkit to increase our economic and general security. I do not currently support reducing the requirement. Obtaining the required signatures is relatively low cost and still offers the opportunity for all economic levels to get on the ballot. I do however support exploring ways for lower-cost campaigns and better campaign finance laws to offer more opportunity for qualified candidates to effectively compete. I support a cheaper alternative – we can just as easily send an electronic copy similar to electronic receipts I get via email or text from my neighborhood bistro. I am a no voter and campaigner against the OSD vote. The rules and laws should be standardized and once the petitioning area meets the set requirements they should be allowed to vote to self-determination and self-governance. The residents should get a voice and vote on self-determination and self-governance. It will be up to each side to present the best argument. As a 15 year resident and first Chair of South Fulton NOW, I led the fight for the right to vote on a City of South Fulton. After investigating the pros and cons of a city along with the results of the independent study by the Andrew Young School at GA State showing a significant annual surplus of up to $19M (vs $600K in 2007) along with a population that doubled since the last vote – I believe cityhood is the best option for my family and neighbors. No. I believe we need to investigate ways to expand access to the ballot box.